New York neighborhoods are rife with generalities, none more pronounced that the Upper West and East Sides. The Upper West is for cultural and artistic workers, the Upper East for more commercial and business types. Nothing is that simple, of course, still, it often bears out. The Upper West has Amsterdam Avenue, the Upper East has Park. The Upper West has Natural History, the Upper East has The Met. The Upper West Side had John Lennon, the Upper East Jacqueline Kennedy Onassis. It feels whiter over here, and older, and a little more, um, generic. Still, it somehow feels more connected to the boroughs and beyond. And there’s no disputing the extra bedroom. One huge upside, though, is our new apartment’s proximity to new running routes, many of which feature broad swaths of water and sweeping vistas. I’ve run nearly eighteen miles in the last seventy-two hours, many of those miles of fresh or only slightly-trodden routes. On Friday, I ran over the Queensborough Bridge through Long island City. 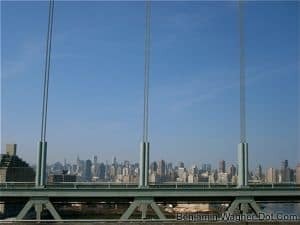 This morning, I ran over the Triborough, through Queens and back over the Queensborough. Somewhere along the way, I considered the meaning of this latest move. Years ago now, I spent a week vision questing in the desert outside Durango, CO. There we studied and constructed Lakotan medicine wheels, symbolic representations of the sacred circle of life, its basic four directions, and the elements. The Lakotan life cycle beings in the east in the spring, moves through the south and westward into fall and winter like, not surprisingly, the sun. Less surprising still, the Lakota were onto something. The implications of the goddess have resulted in theories about whether or not Eostre is an invention of Bede, theories connecting Eostre with records of Germanic folk custom (including hares and eggs), and as cultural descendant of the Proto-Indo-European goddess of the dawn through the etymology of her name. Grimm’s reconstructed Ostara has had some influence in modern popular culture. Modern German has Ostern, but otherwise, Germanic languages have generally borrowed the form pascha. It may be a terrific confluence of coincidences that Abbi and I moved to the Upper East Side on Easter as we expect our first child. Likewise from sunset to sunrise, tunnels to bridges. Or it could be that meaning is born in everything everyday, and it’s all unfolding as it should. That’s understandable that money makes people free. But what to do when somebody does not have cash? The one way only is to receive the loans and just auto loan.